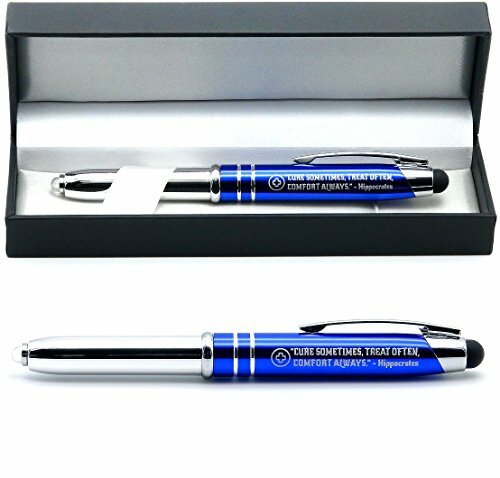 This inspirational medical quote pen is engraved with one of Hippocrates' most well known quotes, "Cure sometimes, treat often, comfort always." Hippocrates was a physician in classical Greece who is today often referred to as the "Father of Medicine." His "Hippocratic Oath" to "do no harm" is taken by modern physicians upon entering the profession. This Hippocrates' quote-engraved pen makes a suitable gift for medical office staff, medical student graduation, and nurse appreciation day. It packs multiple functions into a single compact design: write, light, and touch. Batteries included: 3x L736 / AG3 / LR41; Refill with mini D-1 size ink refills. Engraving reads, "CURE SOMETIMES, TREAT OFTEN, COMFORT ALWAYS. - Hippocrates"
Comes in a satin-lined keepsake presentation case for easy gifting; Makes a suitable gift for any nurse, doctor, medical student, or medical professional. Stylus tip can be used to smoothly operate tablets, phones, and other touch screen devices. Rubber stylus tip imitates the touch of a human finger, without leaving dirt and fingerprints on your touch screen device. If you have any questions about this product by Inkstone, contact us by completing and submitting the form below. If you are looking for a specif part number, please include it with your message.